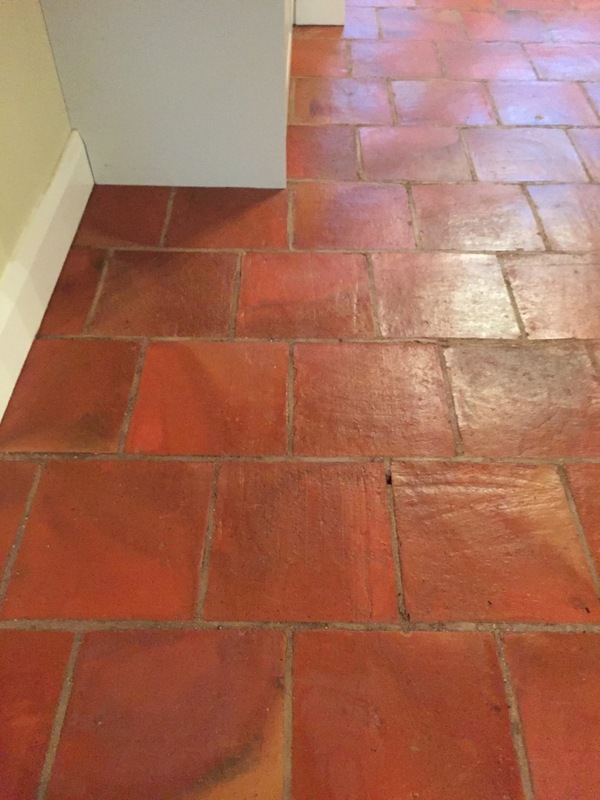 Anyone with familiar with tile cleaning and maintenance will know that Terracotta is one of the most difficult of tiles to seal. This is due to the clay being particularly porous thus requiring several coatings of sealer to ensure complete saturation and protection against ingrained dirt and stains. The next problem is that a sealer will wear down in high traffic areas first and without regular maintenance will wear off allowing dirt to penetrate resulting in areas which seem to be impossible to keep clean. 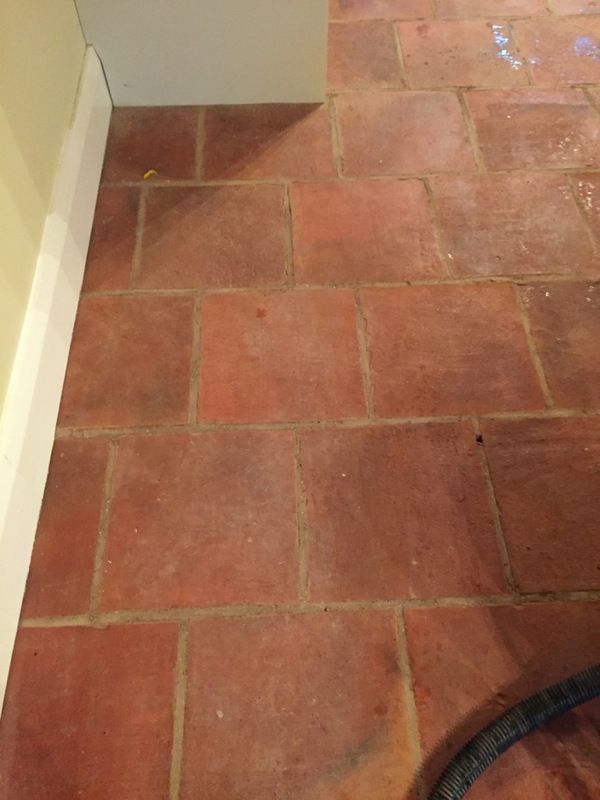 At this property in Minehead, the coastal town in Somerset known for its beaches, the sealer on the Terracotta kitchen tiles had not been maintained in over four years and during that time, the sealer had deteriorated, allowing dirt and dust to enter the pores of the stone. 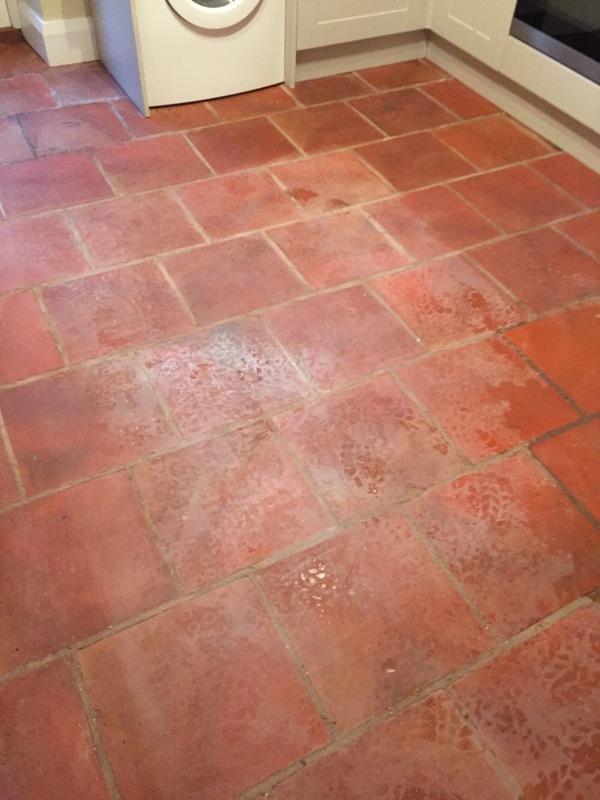 Trying to get the floor to look clean was now an impossible task so I was contacted by the property owner to resolve the problem first by cleaning the tiles with professional products and methods, and second by applying a fresh sealer. 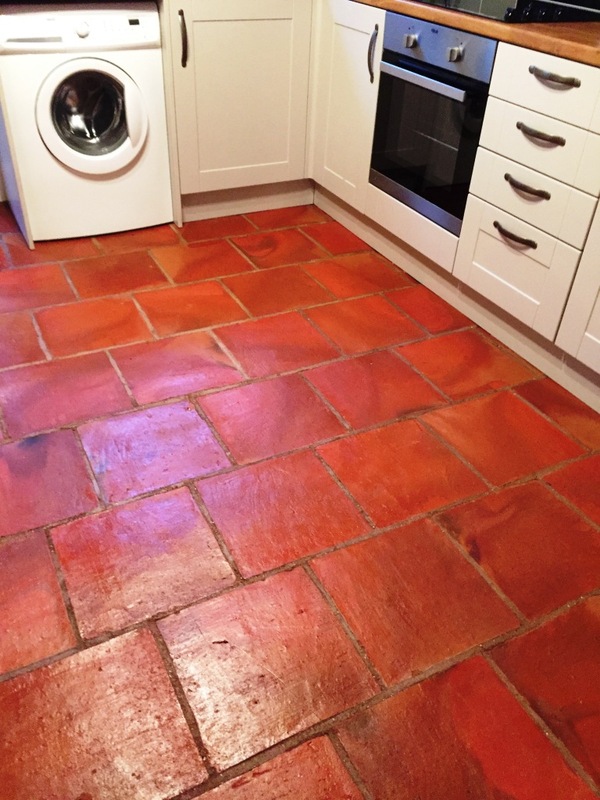 My focus for the cleaning process was soak the Terracotta tiles in Tile Doctor Pro-Clean for around ten minutes before scrubbing the solution into the tiles with the aid of a rotary machine fitted with a scrubbing pad. Pro-Clean is a powerful alkaline cleaner designed for use on all types of natural stone. In concentrated form, it breaks down old sealers as well as removing dirt, while the rotary machine helps the product to penetrate deep into the pores of the stone to eradicate ingrained dirt and stains. The now soiled solution was extracted from the floor using a wet vacuum and the then the floor rinsed with water. With the floor clear I was able to see stubborn areas that need more work and spot treated them using the same process. One I was happy that the floor was clean and free of old sealers it was given a final rinse and then dried as much as possible using the wet vacuum and then then left to dry off overnight. The next day, I returned to the property to find the tiles fresh, dry, and ready to be sealed. My sealer of choice was Tile Doctor Seal and Go, a topical sealant which provides a robust seal and the durable low sheen finish in one product. Sealing the floor took some time as you need to let the first coat dry before applying the second and if you recall from my note at the beginning of this post it’s important to use several coats of sealer on Terracotta to achieve saturation due to the naturally high porosity of the clay. The floor is now fully sealed and looking like new, additionally It will be easy to keep clean simply by using a mop and Tile Doctor Neutral Tile Cleaner which is a pH neutral product designed for the routine cleaning of sealed tiled floors.